Capture the spirit of a dead witch before she claims another victim! Capture the spirit of a dead witch before she claims another victim! Summer camp has always been about good memories and new experiences. But the children at one particular camp never expected to be terrorized by a murderous ghost! When a mother hires your services as a private investigator to find her missing child, all you know is campers have been disappearing faster than you can say "Rise and shine!" After you arrive at the camp, you see a black cat morph into a spectral figure, but you still don't know the full nature of what you're facing. However, as you search the ghoulish grounds for clues, solve puzzles designed to stop you dead in your tracks and open doors that reveal bone-chilling new locations, you'll draw ever closer to the horrifying truth. You'll also come to realize there's hope for the missing kids as long as you overcome your fears and press on. 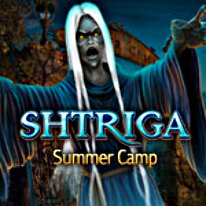 If your spine could use a tingle, or your blood a curdle, then play Shtriga: Summer Camp today!